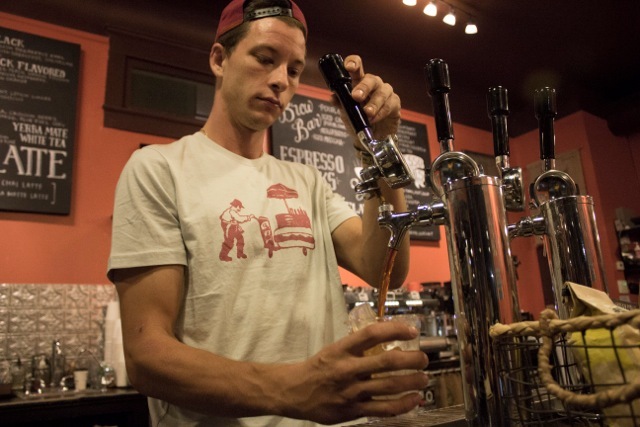 Max Rowdon, the barista, pours coffee for a customer. He has been the barista at Mojo's for several months. To all the freshman new to campus, new to the city, and new to the local fare, I have some advice: drink local. “Think local,” “shop local,” “stay local,” we hear. We’ve been told this is an important concept that ends unfair wages and boosts the local economy, but the importance of knowing our local options goes further than moral conviction. For instance, it pays off to travel the extra mile and enjoy a cup of coffee at a local coffee shop. Local food, drinks and artistry are often better quality than the products spit out of the bigger, corporate machines. It is a reciprocal relationship: we support our local businesses and our local businesses give us their best. 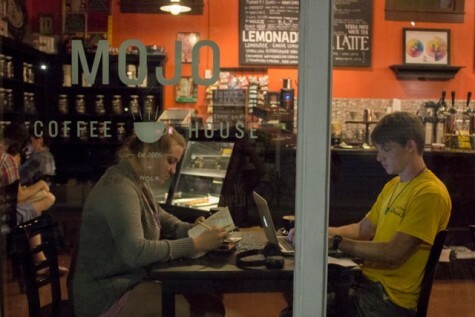 Catilyn Woltz and Dillon Tauzin, Loyola seniors, enjoy drinks while studying. They represent the growing trend of frequenting coffee shops. If you haven’t tasted freshly roasted, ground, and brewed local coffee, have you tasted coffee at all? I’ll argue that you haven’t. I know plenty of people who would not consider drinking their coffee black before they knew just how great coffee could taste. That is because the coffees they were introduced to were usually Starbucks or Folgers, both companies notoriously offering a burnt, bitter taste. This burnt taste can be attributed to larger companies’ call for mass production. With over 21,000 stores worldwide, Starbucks must roast beans at higher temperatures to produce large quantities of coffee at a faster rate. For independent companies, this isn’t so. They have the time and resources to appreciate and roast their beans at an appropriate rate. This lends to the smooth and robust taste local coffee will offer. The taste of fresh local coffee is only the icing on the cake. Local coffee shops are personable. Imagine this scenario: you walk through the door, beeline to the counter, your barista greets you by name and starts working on your order. There weren’t 10 people impatiently fiddling their fingers behind you. Your barista knew your name and your order. For me, this brings a feeling of peace. This deconstructs the busy, impatient atmosphere. You can stop and remember that the person behind the counter is a person, as are the connoisseurs around you. This brings another, almost communal dimension to enjoying coffee. So simple, yet so satisfying. Food tastes better when you know where it comes from. There is a common misconception that larger companies sell their product for less than local businesses. This is hardly true. With as much coffee as we consume, we should realize our effect as the consumer and the responsibility that comes with that power. It is important to know that your growers and roasters are benefiting from your purchase as much as you are. Fair-waged coffee will have more care put into it, tending to make sure it taste better. Starbucks is great for seasonal drinks and sweet, icy treats. However, if you want to experience coffee in its essence, you’ll need to take your business elsewhere. Find an independent coffee shop that cares about the coffee they create. These coffee shops aren’t for the faint of heart. They aren’t as convenient as Starbucks or the Keurig machine in your suite. I would argue that they are better, though. Better for the world, better for our community, and better for the consumer, which is why you should check out a local coffee shop right now. The individual who wrote this article has no idea what he’s talking about. For example, Starbucks and Foldgers don’t even use the same type of coffee bean (Arabica vs. Robusta). Also, many of the darker roasted coffees are less bitter, as they have less acidity than medium and light roasted (all 3 of which are offered by Starbucks). Chances are your local coffee shop also doesn’t clean or change parts on their equipment as frequently. Did you also know that Starbucks is actually largely responsible for paying producers fair wages? Yep, the founded C.A.F.E. Practices to ensure this and because of their buying power it forced other organizations, including your local shop to pay higher prices for coffee. My baristas at Starbucks know my name, and my drink. They are talented, knowkedgable, and fast… And they have great benefits, benefits a local shop couldn’t provide. Ask several of the charities in your area who gives more, the local shop or Starbucks (they participate and contribute to a wide range of events). Ignorant people while entitled shouldn’t share their opinions as if they did any research, as if they actually know what they are talking about. It would help greatly if I knew what I was getting at my “local Starbucks”. At times, it’s spot on, other times, it certainly doesn’t taste like a caramel macchiato, and believe me, I’ve had enough to know what they taste like. I’ve wasted TONS of money getting cr*p, for I’m not the one time I took it back, the second was made even worse. I agree, there is no comparison to a genuine NOLA coffee. Period. To the angry individual who wrote the first comment. It doesn’t matter the difference of the beans, that wasn’t the point of that sentence. The point was that they over roast the beans whether they are Arabica or Robusta doesn’t matter there. They are over toasted and taste burnt and bitter. I’d much prefer to go to a local coffee shop and put my money back into my local economy than give it to a corporation.